As we have passed the one year anniversary of his last post, I have finally felt like I could share my pain with everyone. AJStrata, my husband, was dedicated to the truth. He used this blog as the platform for sharing his investigations with the world. His first post was in May of 2005. Early on he found that he could not stomach the MSM and wanted to do his own due diligence to find the truth. He loved finding new sources and fellow bloggers who shared his own passion for politics, current events, and climate change myths. Even though he is gone, know that he enjoyed the debates with readers and was always humbled that others wanted to visit this site. 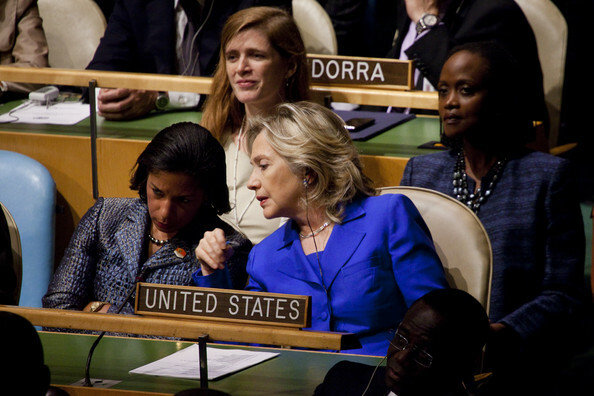 Please note the trip down memory lane above, when Susie and Hillary were cohorts at the UN. The thing to bear in mind is that the White House does not do investigations. Not criminal investigations, not intelligence investigations. Remember that. In general, it is the FBI that conducts investigations that bear on American citizens suspected of committing crimes or of acting as agents of foreign powers. In the matter of alleged Russian meddling, the investigative camp also includes the CIA and the NSA. Consequently, if unmasking was relevant to the Russia investigation, it would have been done by those three agencies. Basically what these tools have done is confess to the crime. Rice did not deny she did this, she claims she had the authority to do this. Susan Rice (and her protectors in the news media – one of which is her husband at ABC News) have been putting out a new trial balloon to see if they can avoid the coming Constitutional crisis over the Obama administration using NSA surveillance data to data-mine their political opposition: a.k.a. Team Trump. 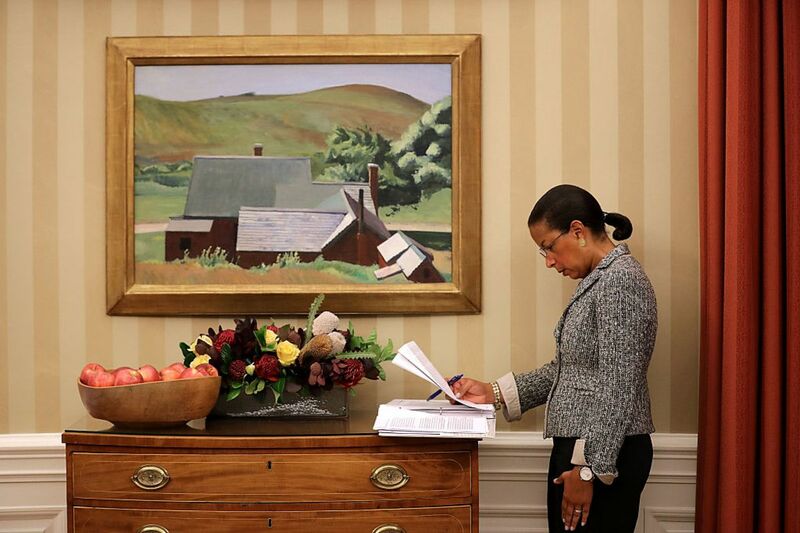 Rice denied those charges Tuesday, saying she was “shocked” to read the claims when they emerged. She said the White House isn’t responsible for ordering that type of surveillance. She maintained, however, that asking for more information about names included in intelligence reports was a routine and necessary aspect of her job in protecting American security. Uh – no. The White House – which is where she worked when National Security Advisor (please not the emphasis on “Advisor”) – cannot investigate US citizens for criminal acts. The White House cannot even direct the FBI who to investigate or not! The Assistant to the President for National Security Affairs (APNSA) is appointed by the President without confirmation by the Senate. The influence and role of the National Security Advisor varies from administration to administration and depends not only on the qualities of the person appointed to the position but also on the style and management philosophy of the incumbent President. Ideally, the APNSA serves as an honest broker of policy options for the President in the field of national security, rather than as an advocate for his or her own policy agenda. This role is to assist in drafting policies, strategies, regulations, etc. So one has to ask, why was she unmasking these innocent people and violating their 4th Amendment Rights? She actually should have no ability to peak into the lives of Americans. None. Not in her job-jar. The White House is NOT authorized to investigate – not even foreign players. Those authorities are given to a select few organizations in the federal government. And when it comes to investigating US Citizens, that falls to one and only one federal organization: The FBI. I know the Democrat News Media is trying to shield Rice and Obama from their bumbling, stumbling activities that will destroy their legacy. The Democrats & News Media (there’s a difference?) are deteriorating into insanity as President Trump’s “surveillance” tweet continues to disrupt DC and expose one of the Capitol’s dirtiest secrets. A secret kept under cover by the self-absorbed Political Industrial Complex (PIC*), whose members have been wrapping themselves in the American Flag to coverup gross abuses of power. A secret they themselves have benefited from. Later in life and after his death, [J Edgar] Hoover became a controversial figure as evidence of his secretive abuses of power began to surface. He was found to have exceeded the jurisdiction of the FBI, and to have used the FBI to harass political dissenters and activists, to amass secret files on political leaders, and to collect evidence using illegal methods. Hoover consequently amassed a great deal of power and was in a position to intimidate and threaten sitting presidents. The power I speak of today is the power to surveillance anyone, any time. It was created out of sincere, good intentions. To stop another 9-11 massacre. But as with all great power, it has corrupted our current leaders who began to see themselves as the defenders of America – and so somehow more important than any normal citizen. They bequeathed to themselves extra-legal authority and rationalized obliterating the 4th Amendment. “Better to snoop on everyone (which is lazy) than miss an attack”. That thinking is akin to locking everyone up just so we don’t miss any murderers or drunk drivers. Like I said: Lazy. If you are in the inner circle of Federal Politics you have had access to information that is a pure goldmine. You have insights into political leaders and players, insights into international strategies and thinking. You can see through the normal veil of “private conversations” on a grand scale, detect events as they are being planned, before they happen. And you can fight off those who naively (in your own warped mind) want to take or curtail your weapon against evil! The problem is – that surveillance capability was meant to protect Americans from terrorism and other forms of outside attack. It is illegal – in that it is a violation of the 4th Amendment of the Constitution – to have access to this kind of detailed information on Americans without demonstrable due cause, confirmed in the form of a warrant (either from a normal criminal court or the FISA court). A critical detail that has been ignored by too many for too long. What Washington DC forgot is that Donald Trump is not from the Political Industrial Complex. He does not rely on this fountain of ill-gotten power to achieve his goals. He was able to beat the denizens of the PIC without this devil’s crutch. And he is more than likely ready to put this evil genie back in the bottle, to be opened by a few and only when a cause has been demonstrated. It is now clear from news media reports on damning details in surveillance records – plus the loose-lips of one bit player in a political strategery – that during the primaries, during the election and during the post-election transition Democrats used surveillance data about Americans for political purposes. This is not refutable anymore. Emphasis mine. Even the release of details regarding foreign players is illegal. It exposes our capabilities and notifies our enemies they need to take steps to cover their tracks better. But we have much more than that here. The evidence documented by the news media of wrong doing is extensive. But they want the gravy-train of leaked surveillance data on Americans to continue. It suites their bottom line. So don’t expect the news media to be open about what is going on. They will deflect from their sources and try and keep the nation distracted by rumors of collusion outside America. All the better to keep people from seeing the collusion from within. The Obama grand plan to disperse cherry-picked surveillance throughout government in order to keep pushing the diversionary story about Trump and Russia had a serious flaw in it. To disperse the ill-gotten propaganda would mean it would fall into less seasoned hands. And these less seasoned hands may blow the whole deal. Well, I was urging my former colleagues, and, and, frankly speaking, [to] the people on the Hill, it was more actually aimed at telling the Hill people, get as much information as you can – get as much intelligence as you can – before President Obama leaves the administration. Because I had a fear that somehow that information would disappear with the senior [Obama] people who left. So it would be hidden away in the bureaucracy, um, that the Trump folks – if they found out HOW we knew what we knew about their, the Trump staff, dealing with Russians – that they would try to compromise those sources and methods — meaning we would no longer have access to that intelligence. So I became very worried because not enough was coming out into the open and I knew that there was more. We have very good intelligence on Russia. So then I had talked to some of my former colleagues and I knew that they were also trying to help get information to the Hill…That’s why you have the leaking. 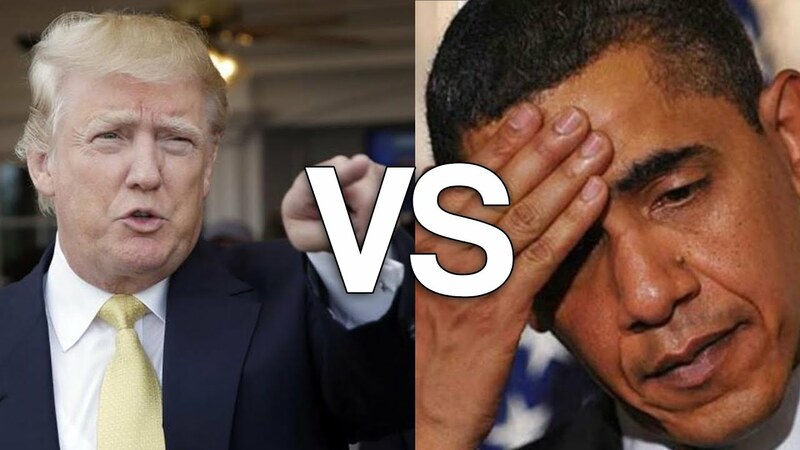 “If they [Team Trump] found out how we [team Obama/Clinton] knew what we knew”…. Just savor that for a while. If the new Sheriff in town found out what the previous Sheriff had done …. This is a constitutional crisis. It will consume many top level people who have given cover to these abuses of power for too long. In another report Farkas notes she was communicating with members of both parties on “The Hill”. Don’t believe for an instant Democrats will take all the hits on this one – just most of them. Poor Ms. Farkas has been trying to undo the damage she has done. She has even gone so far as to blame the Russians for her loose-lips. My guess is she has been given a short time period to try and undo this before she herself gets thrown under the bus. But make no mistake, all she did was confirm the NY Times’ claims. This issue is toxic to political careers. You don’t get caught red-handed violating the Constitution (our privacy and the assumption we are innocent until proven guilty) and survive as a politician. There appears to be a good many heads on the line given the screeching cries for House Intelligence Chairman Nunes to step down and Trump to be Impeached. The pitch and volume of cries from the left mean some big players are about to be hoisted on their own petards. The more fevered the cries from the left, the bigger this thing has become. The Sunday shows should be wall-to-wall Democrats and Media circling the wagons and trying to get everyone to look at Russia and not Obama/Clinton. Emphasis mine. This is Obama’s (and Farkas’) worst nightmare. Someone willing to come forward and skip the long dance of congressional requests and executive delay and just toss out the document ID numbers that hold the evidence. This is why the Democrats and the News Media (again, is there any difference – I guess in a few corners of Fox News) are going nuts this week. My guess is Team Obama was so shaken with the realization that Team Trump would have access to all the evidence one would want to show illegal activities before the election, this desperate last minute move to disperse cherry-picked data to deflect from the true crimes seemed like their only play. But of course the cover up is always worse than the crime. This is one big and ugly iceberg that needs to come out into the sun and be melted away. This is akin to a military coupe, where military resources are used to influence an election. While no tanks or fighter jets were used to ‘influence’ voter decisions, the awesome power of our National Security Intelligence resources may have been. So don’t let the News Media/Democrats distract us from the true crime here. Russians did not vote in Donald Trump – fed up Les Deplorables did. 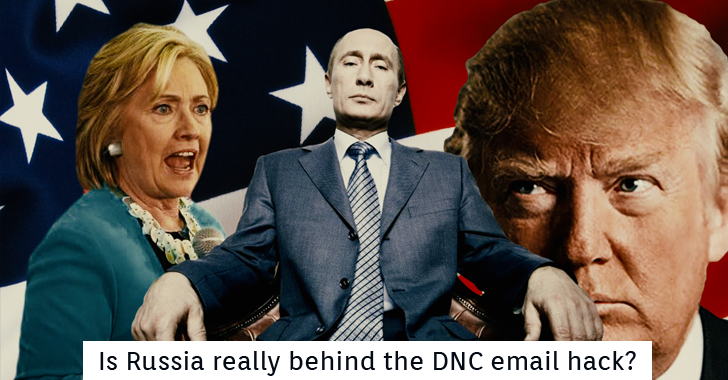 Russians did not make Hillary Clinton the worst candidate in memory – the Democrats did. And Russians did not make Obama turn this nation’s defense systems against his political opponent. Everyone in DC assumed Trump would protect this grotesque use of our national defense as those before him had. I have seen ridiculous interviews with the likes of Gen Wesley Clark on Fox News trying to divert attention from this to protect the unfettered monitoring of Americans. It never occurred to the denizens of the PIC that the best defense from this kind of abuse was sunlight. And sunlight would also cleanse us of the decay that had created this rot. It never crossed their feeble minds that Trump would simply expose the whole ugly mess to not only protect himself and his team – but to drain the swamp itself. The Intelligence Community is not monolithic politically, and generally they prefer to stay apolitical. Therefore I am not surprised there are people willing to turn on team Obama. I am just curious how big the wave will be now that the damn has cracked. If Congress wants evidence of illegal surveillance of “Team Trump” I have the answers. The childish and slippery word games being used by both Congress (Dem and Rep alike) and the Fake News Media is fooling no one. The fact a surveillance of possible national threats is legally allowed DOES NOT in turn mean the 4th Amendment is suspended in any shape or form regarding US Persons impacted during that surveillance. The illegal application of our intelligence capabilities – to divert them from protecting this nation and instead using them for political purposes – is not a slippery or semantic problem. The law is precise: it is illegal. 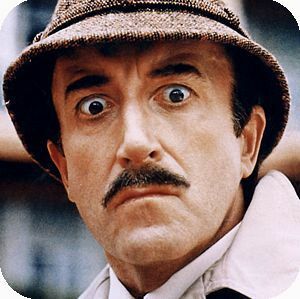 If a US Person is ‘caught up” in an intelligence gathering activity targeting someone else, that fact (i.e., their name or their part of the conversation) SHOULD NEVER SEE THE LIGHT OF DAY! To continue to pretend ‘framing’ the topic of this issue will confuse the voters is simply confirming the wisdom and insight of the pro-Trump voting block. We won’t get fooled again by the denizens of the Political Industrial Complex*. The PIC have been to the “Wordsmith’s Well” too many times. Their credibility is shot. My apologies to Gen Hayden and Sen Graham, but while someone “can” unmask the details of surveillance details about a US Person, they really cannot without running afoul of the US Constitution. Robbers “can” rob banks, Generals can issue kill orders on civilians, Police can shoot innocent people and Politicians can break laws as they see fit. If they do and are caught doing so they need to prosecuted to the fullest extent of the law. No sane person claims laws stop illegal behavior. But do illegal acts by our leaders mean laws should be ignored? What you see in these kinds of statements is resignation by our leadership to allowing rampant illegal activities. “It’s always done” is how rampant bribery and kickbacks become the norm. This kind of complacency is grotesque. What? He is not what these tools wanted as President? In this prior post I noted the paper trail required for any details about US Person to be unmasked and distributed to points inside the Intelligence Community where they could be later be leaked (most likely via Congress where members (or their staff) caught leaking cannot be “fired”). If Congress has not reviewed the FISA applications, or these records required for distribution, or any assertion by President Obama to use his independent powers to implement a surveillance program (see this early post), then they are not doing their job. And one has to wonder why Congress would want to hold back and not look into every possible avenue? What are they concerned about uncovering? Now that they [the NY Times] don’t want you to believe there was an investigation — because that would be an Obama abuse of power — they want to convince you that Trump associates were never targeted for surveillance. Let’s see the FISA applications and warrants. If there was no targeting of the Trump campaign, as the media and Democrats now say, let’s hear an explanation of why they’ve pretended otherwise for four months. If the Trump campaign was targeted for an investigation, let’s hear why. The Ministry of Truth is the propaganda ministry. 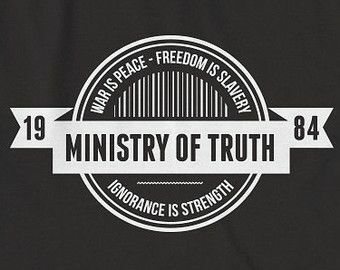 As with the other ministries in the novel, the name Ministry of Truth is a misnomer because in reality it serves the opposite: it is responsible for any necessary falsification of historical events.